Papil, on the island of West Burra, off the western mainland of Shetland, lies at the north end of the sea route from Orkney (Lamb 1995, 15, 22). The church lies in a notably sheltered and fertile valley: ‘Owing to the presence of limestone the soil of Burra is very fertile, crops ripening here somewhat sooner than in the mainland’ (Cowie 1874, quoted in Goudie 1881, 206).52 A century earlier, Low, however, describes West Burra and the adjacent island of East Burra (more often referred to as House (eg. Sibbald 1711, 54)), as ‘fitter for pasturage than tillage’, with House being ‘mostly moorish’ (1774, 189). In contrast to the island of Papa, just to the north, with which it may have been linked (see S3), Burra is not named on the earlier maps - even on the one occasion when the church is marked (Thomas 1838). 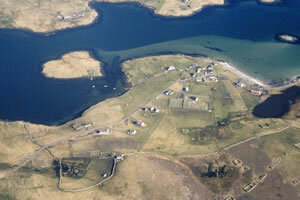 The island is, however, anciently termed the Kirk Isle ‘by way of pre-eminence’ (Sibbald 1711, 54; Goudie 1881, 206). Blaeu (1654) has Paphill on the west side of the island, and it is also spelled in this way by Sibbald (1711, 56). Several dwelling houses lie around the church (NB, Shetland, Book 7, 49), while the earlier editions of the OS map suggest the settlement of Papil comprises three roofed clusters. The Holm of Papil is located just to the north, off the east coast of Burra; a well, a house and pier are depicted on the islet on the OS First edition map. The Loch of Papil lies to the south-west, forming part of the head-dyke for the township of Papil. S9.1 Aerial view of Papil Burra. The dedication of the church at Papil - to St. Lawrence - is first given in 1547 (Goudie 1881, 207). This is a dedication which stems very much from the Roman tradition and has been cited as supporting evidence for the strength of that tradition in the Pictish church (Thomson, 2001,21). This relates to the arguments forwarded by Lamb that “Peterkirks’ in Orkney can be seen as forming a network of proto-parish centres from the pre-Norse period (1995, 19-23). There are no ‘Peterkirks’ in Shetland, but the Laurence dedication at the most important Papil site might be taken as providing some support for the theory that the Pictish church in the Northern Isles was more ‘Roman’ than ‘Celtic’. The trouble is that we simply do not know, and cannot say whether the dedication stems from the pre-Norse period or if it was applied to this church site by Norse Christians in the centuries after their settlement and conversion. In 1701, Brand described the church as very large, with a ‘high steeple’ (ibid., 206), implying that it might have had a round tower similar to that at Egilsay (NMRS no. HY43SE1). Sibbald (1711, 55), quoting an account written in 1654 (cf. Cant 1976, 21), describes the church as having been built ‘by the Mid-most of the three Norwegian Sisters, the eldest having built the Church of Tingwall [NMRS no. HU44SW12] and the youngest sister the Church of Ireland’ [NMRS no. HU32SE3]. Like Tingwall and Ireland, it is said to have possessed a tower five or six storeys high and, although the church was small, it was ‘very fashionable’ (Sibbald 1711, 55). The tower and the chancel survived in Sibbald’s day (ibid. ), while both Low (1774, 189) and the author of the OSA also mention a steeple (Menzies 1792, 199-200), implying that it was still standing at the end of the eighteenth century. Although the Name Book states that the remains of the present church stand on the site of the earlier St. Laurence’s Church (NB, Shetland, Book 7, 40), Moar and Stewart, possibly quoting Goudie (1904, 53), believed that St. Lawrence’s Church, which Edmondston states had been destroyed by 1809 in order to build its successor (completed 1815), was sited to the north and west of the new church; traces of lime and mortar in this area were attributed to the original church by Moar and Stewart (1944, 91-2). A third building traditionally stood on the north side of [the original?] St. Laurence’s Church (ibid., 91). In 1841, the new church at Burra was described as conveniently situated in the centre of the parish and, although only 26 years old in 1841, was seldom in a tolerable state of repair (Marshall 1841, 16). On the OS First edition map, it is shown as an east-west aligned building, with an unroofed east end, lying towards the east side of the square burial ground. This church, abandoned in its turn in 1920, is now roofless. In opposition to Moar and Stewart, it is clear that more than one church probably occupied this site in succession. The shell of the present building stands on a mound, particularly well defined at its east end, while the foundations of an earlier structure, although not actually seen by them, were reported to MacDonald and Laing as being visible under its floor (1969, 128). However, the Ordnance Survey surveyor, at about the same time, did record a stretch of about 5.0m of old foundation walling below the floor-boards (1968, information contained in NMRS record). The mound is enclosed by a rhomboid -haped enclosure, somewhat smaller than the present bounds of the graveyard, which Thomas believed represented a Christian Norse cemetery or monastic enclosure (1973, 10). Underneath the modern graveyard wall is a bank, about 3ft high and spread to a breadth of 12ft in places; MacDonald and Laing found a late Viking potsherd on its inner slope (1969, 128). The Papil Stone (FIG.S9.2) was discovered in 1877, with its decorated side uppermost and lying just a short distance to the south of the church; it had been re-used as a grave cover by the family of John Inkster, a local Baptist minister, and had been assumed by them to have been brought from “the East” at some unknown period (Goudie 1881, 199; 1904, 44-7; 1912, 14; Moar and Stewart 1944, 92; Stevenson 1955, 115; Fisher 2002, 53, fig. 3.9; SMR no. PRN 343; NMAS no. IB 46). Many of the details of this cross slab, with its circular cross head, recall those on the Bressay stone from Culbinsburgh (Goudie 1881, 202-3; 1904, 47). The seventh-century date postulated on the basis of the cross head is somewhat belied by the sophisticated lion below it (Stevenson 1955, 115); the interlace on the cross head recalls Irish examples and is also common on Manx crosses (Fisher 2002, 54). A further cross-slab with slightly splayed arms and a long stem was also found by Goudie and left undisturbed (1881, 204-5; 1904, 49; Moar and Stewart 1944, 92-3); this, although its form is slightly unusual, finds its closest parallels in stones of twelfth century or later date (Thomas 1973, 31). Corner posts from slab shrines and a fragment of an interlaced cross-slab were found in April 1943 during gravedigging; one was found with a skull at its foot (Moar and Stewart 1944, 91, 93ff; Fisher 2002, 53, fig. 3.10). The interlaced cross-slab finds its closest parallels in a slab from Glendalough and in two examples from Iona, one of which has a Norse inscription; all these examples are likely to be of late tenth-century date (Fisher 2002, 54). Of most importance is the shrine-panel, carved in low relief and showing a cowled rider and monks walking towards a free-standing cross (FIG.S9.3).This is probably later in date than the cross-slab and has led Thomas to postulate a major Early Christian monastery at Papil (Thomas 1971, 37, 153-7; Thomas 1973, 8-9). Elements of probably two slab shrines, including a double one, have now been found at Papil; all of the fragments, some of which have subsequently been lost, were recovered from the north side of the present church and would be consistent with an eighth-century date (Thomas 1973, 8, 20-1, 25-7, 29-30). If Moar and Stewart’s proposed location for the original church is correct, these would then have lain to the south and east of it, where important burials could be expected and suggesting that both church and burials might be contemporary (ibid., 10). Significantly, local knowledge suggests that the stone used in these monuments is not local in origin (ibid., 43-4), although it probably came from the mainland a few miles away (Moar and Stewart 1944, 92). A further corner post from a slab shrine was found during gravedigging in 1995 (Watt and Tait 1996, 92), while a runic inscription, probably of eleventh-century date, was discovered in 1951, some 200 yards to the south-east of the church (NMRS no. HU33SE1, SMR no. PRN345, HU 3698 3141; Shetland Museum no. ACR 65860); according to Thomas this too could have originated as part of shrine panel (Thomas 1973, 31). In addition to the church at Papil, there were chapels at Southerhouse and Sunnybank on West Burra. The chapel at Southerhouse or Brough, the highest inhabited part of the island, was described by Sibbald in 1711 as altogether ruinous (1711, 55). Just as Sibbald could not identify either its date or dedication, no local knowledge of the chapel was recoverable in the twentieth century and only slight ground disturbance is visible today (RCAHMS 1946, no. 1276; NMRS no. HU33SE9, HU 3784 3492; the NMRS call it Southermouse). There is no information for Sunnybank and this may be a much more recent chapel as it is shown as roofed on the modern map (NMRS no. HU33SE78, HU 3734 3371). Parochial History - see under Site S3. The conjunction of Papil name and impressive church site at Burra gives out an important message. 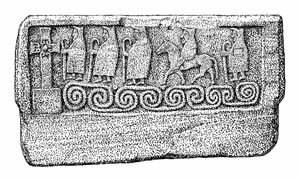 This is a key site for our understanding of the situation of a ‘papar’ place, and the sculpture provides the most convincing evidence for a ‘major Early Christian monastery’ of any of the Shetland Papils. At least it makes us acknowledge that this place called by the Norse papar--byl must certainly have been an important community of Christian clerics, and that this name was therefore given by the Norse to at least one such ecclesiastical centre which they discovered in the islands at the beginning of the Viking Age (whether that name was given at that time or later). These stones were commissioned and erected by the ‘papar’; nothing exemplifies this better than the Papil slab with its procession of clerics and leader (‘senior churchman’-abbot or bishop?) sitting on the pony. They must have controlled resources from land and they had ‘socially-privileged positions’ (ibid, 21). The issue as to what sort of cleric they were, secular or monastic, Pictish or Irish, remains open, as does their function in society (Thomson, 2001,22). From our survey of the evidence above we know that not all the Papil places, or the communities at them, can have been as large or as rich as the Burra one; it seems impossible to deny its pre-eminent status in the Shetland hierarchy of Celtic churches. Ordnance Survey, 1878 (1880-2). First edition. 1:2,500. Sheets LIX.5 and LIX.9. Ordnance Survey, 1900 (1901). Second edition. 1:2,500. Sheets LIX.5 and LIX.9. Ordnance Survey, 1973. 1:10000. Sheet HU33SE. 52Once more the Soil Capability Class description seems to reflect modern-day expectation rather than historical reality.